This week in our series, we continue the story of President John Fitzgerald Kennedy. Kennedy, a Democrat, defeated Republican Vice President Richard Nixon in one of the closest elections in United States history. He took office in January nineteen sixty-one. After three months, Kennedy faced a major foreign policy failure. On April seventeenth, armed Cuban exiles tried to invade Cuba, less one hundred fifty kilometers from the American state of Florida. They had been trained by the Central Intelligence Agency. Their goal was to overthrow the island's communist leader, Fidel Castro. In nineteen fifty-nine he and his guerrilla forces had overthrown Fulgencio Batista, the president who was supported by the United States. The exiles came ashore at Cuba's Bay of Pigs. Most were killed or captured. The last administration, under President Dwight Eisenhower, had planned the invasion. But Kennedy had approved it. After the failure, some Americans again wondered if the forty-three-year-old president had enough experience to lead the nation. In May nineteen sixty-one, Kennedy went to Paris and met with French President Charles de Gaulle. Kennedy visited France with his wife Jacqueline, who spoke French and had studied there. In June, Kennedy met in Vienna, Austria, with Soviet Premier Nikita Khrushchev. Khrushchev did not want to compromise on any issue. He threatened to have the East Germans block all movement into and out of the Allied-controlled western half of Berlin. In November, the East Germans, with Soviet support, started building the Berlin Wall to separate east and west. President Kennedy quickly announced a large increase in American military forces in Germany. Less than a year later came the Cuban missile crisis. 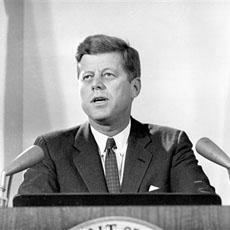 On October twenty-second, nineteen sixty-two, President Kennedy made an announcement to the American people. JOHN KENNEDY: "This government, as promised, has maintained the closest surveillance of the Soviet military buildup on the island of Cuba. Within the past week, unmistakable evidence has established the fact that a series of offensive missile sites is now in preparation on that imprisoned island. The purpose of these bases can be none other than to provide a nuclear strike capability against the Western Hemisphere. "Upon receiving the first preliminary hard information of this nature last Tuesday morning at nine a.m., I directed that our surveillance be stepped up. And having now confirmed and completed our evaluation of the evidence and our decision on a course of action, this government feels obliged to report this new crisis to you in fullest detail. "The characteristics of these new missile sites indicate two distinct types of installations. Several of them include medium range ballistic missiles, capable of carrying a nuclear warhead for a distance of more than one thousand nautical miles. Each of these missiles, in short, is capable of striking Washington, DC, the Panama Canal, Cape Canaveral, Mexico City, or any other city in the southeastern part of the United States, in Central America, or in the Caribbean area." Kennedy had a warning for the Soviets. JOHN KENNEDY: "It shall be the policy of this nation to regard any nuclear missile launched from Cuba against any nation in the Western Hemisphere as an attack by the Soviet Union on the United States, requiring a full retaliatory response upon the Soviet Union." 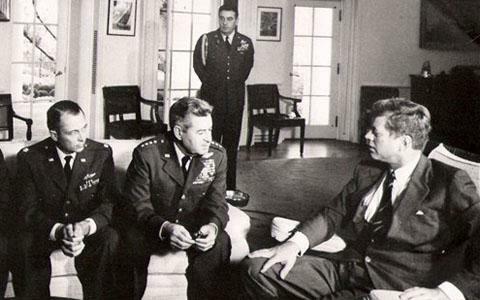 Kennedy and his national security advisers debated what to do about the Soviet missiles in Cuba. Should the United States launch an air strike and try to destroy them? What if some of the nuclear missiles escaped the attack? Kennedy decided to use a naval blockade -- he called it a "quarantine" -- to prevent any more Soviet ships from reaching Cuba. 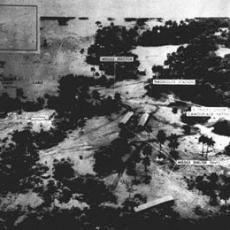 This photograph, made Oct. 23, 1962, shows a ballistic missile site project in the San Cristobal area of Cuba. The photo was released by the Defense Department. There were tense negotiations with the Soviets. Khrushchev demanded a promise that the United States would not invade Cuba. Kennedy agreed, and did so publicly. Secretly he also agreed to another demand. He promised that the United States would remove its Jupiter missiles based in Turkey, after the crisis was over. The Cuban missile crisis lasted thirteen days. It raised fears of a nuclear war. But it ended peacefully when the Soviets agreed to remove their missiles from Cuba, and turned their ships around. But the Cold War continued. In Asia, the Kennedy administration tried to fight communism in Vietnam by increasing the number of American military advisers there. The United States and the Soviet Union did make some progress on arms control. In nineteen sixty-three, the two countries agreed to ban tests of nuclear weapons except underground. Kennedy also had to deal with domestic issues, including discrimination against blacks. His brother Robert was attorney general, the nation's top law enforcement official. The Justice Department took legal action against states in the South that violated laws on voting rights. The administration also supported a voter registration campaign to sign up more black voters. Robert Kennedy repeatedly called on National Guard troops to protect blacks when they tried to register to vote or attend white schools. President Kennedy said the situation was causing a moral crisis in America. He decided it was time to propose a new civil rights law that would guarantee equal treatment for blacks in public places and jobs. Congress did not pass a wide-reaching civil rights bill until nineteen sixty-four. By then Kennedy was no longer president. In November nineteen sixty-three, he traveled to Texas. He hoped to settle a dispute in the Democratic Party in that state. The dispute might have affected his chances for re-election in nineteen sixty-four. Kennedy arrived in Dallas in the late morning of November twenty-second. The president and his wife were seated in the back of an open-topped car as his motorcade drove through the city. Suddenly, there were gunshots. WALTER CRONKITE: "Here is a bulletin from CBS news. 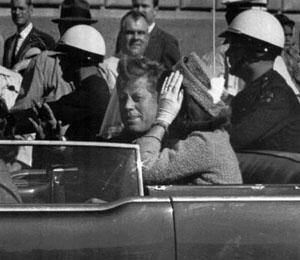 In Dallas, Texas, three shots were fired at President Kennedy's motorcade in downtown Dallas. The first reports say that President Kennedy has been seriously wounded by this shooting." WALTER CRONKITE: "From Dallas, Texas -- the flash apparently official -- President Kennedy died at one p.m., Central Standard Time." Police quickly arrested a suspect. Lee Harvey Oswald worked in a building near where Kennedy had been shot. People had seen him leave the building with a gun. Lee Harvey Oswald was a man with a strange past. He was a former United States Marine. He was also a communist. He had lived for a while in the Soviet Union and had tried to become a Soviet citizen. He worked for a committee that supported the communist government in Cuba. 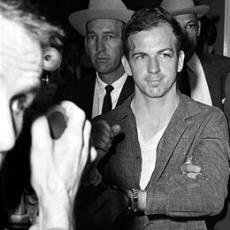 Police questioned Oswald about the shooting of President Kennedy. He told them he did not do it. After two days, officials decided to move him to a different jail. Oswald was being led by two police officers. Suddenly, a man stepped forward. There was a shot. Oswald fell to the ground. Television cameras broadcast the events live. The man who killed Oswald was Jack Ruby. He was a nightclub owner in Dallas. He said he shot Oswald to prevent the Kennedy family from having to live through a trial. A commission investigated the assassination of John F. Kennedy. The chief justice of the United States, Earl Warren, led the investigation. In its report, the Warren commission said that Lee Harvey Oswald had acted alone. It said there was no plot to kill the president. Many Americans never accepted that finding. Some blamed Fidel Castro or the Central Intelligence Agency. Others blamed organized crime. 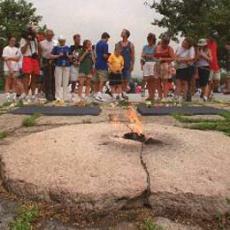 President Kennedy was buried in Arlington National Cemetery, across the Potomac River from Washington. An Eternal Flame burns night and day by his grave.